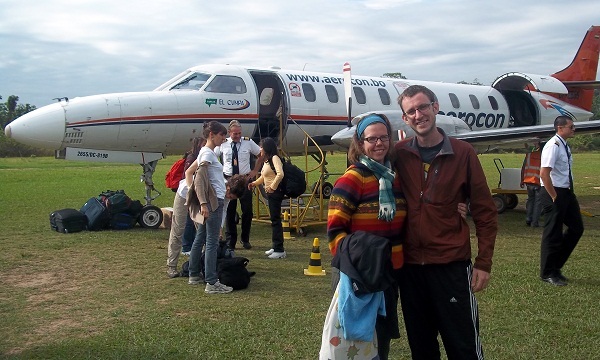 We left the cold city of La Paz on a 10 person airplane headed for Rurrenabaque, Bolivia, home to the Beni river and gateway to Madidi National Park. 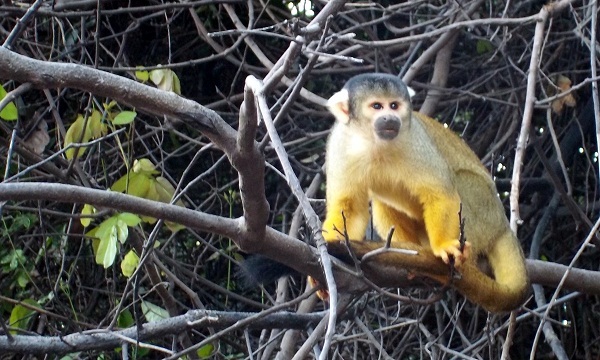 Madidi National Park is Bolivia’s chunk of the Amazon Rainforest and the start to one of our best excursions to date. The flight to Rurrenbaque was breathtaking, we started in La Paz and quickly found ourselves over the snow-capped Andes. Within 20 minutes the once snow-capped Andes changed into jungle covered green mountains as we approached Rurrenbaque. We landed at the “airport” in Rurrenbaque. One paved landing strip, and then one unpaved road for taxing. Rurrenbaque is 45 minutes from La Paz by plane (or 24 hours by bus) and a whole new world. It is hot, humid, and full of life. The town of Rurrenabaque is small, but alive with energy. The locals are smiling, cheerful and the atmosphere is much more laid-back. We loved it. Our tour guide picked us up from the airport and we started our 3 hour drive on a dirt road from Rurrenabaque to the boat that took us deep into the jungle. The boats are about 20 feet long and have a small outboard engine on the back. We hopped on the boat with 6 other travelers. 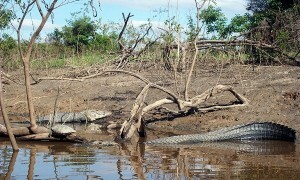 Immediately we were surrounded by alligators on the banks of the river. 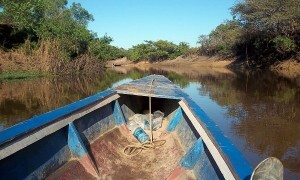 We cruised up the river for 2 hours to our bungalow in the jungle. We saw a huge sign “We serve cold beer” and a dock. This was going to be a fun couple of days. 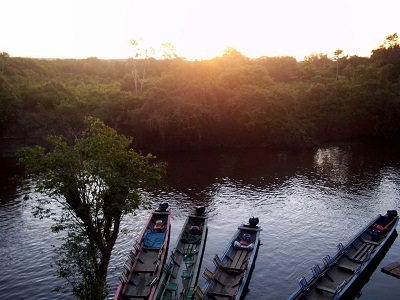 We unloaded our stuff into our new home in the jungle and cracked open an ice cold brew on the dock. The view was breathtaking as we watched the sunset on our first day in the jungle. We got up early and headed into the boat for a day of cruising around looking at the wildlife. We saw hundreds and hundreds of alligators. 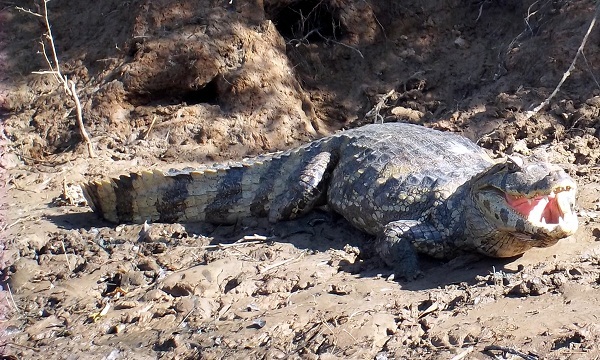 Maybe 50 black caimans. Some easily 14 feet long. They were big, scary, and mean. The guide said the alligators are harmless, but the caimans are a little more nasty. We also stopped to take a look at some crazy looking birds, a sloth, capybaras, pink river dolphins, howler monkeys, and some little brown and yellow monkeys. 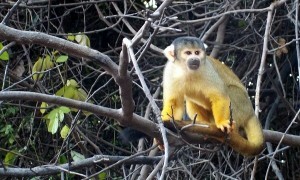 The little monkeys were really curious and friendly. They came right up to our boat, and even tried to steal some fruit we had in the back of the boat for lunch. Capybaras are these huge rodents that live on the banks of the river. They grow is almost 150 pounds and look like a guinea pig that has grown to the size of a large dog. They are pretty harmless, ugly, and kinda just stand around in the mud. It was a world of fun cruising around in the boat. Excursions like these are surreal and with all the day to look around on the boat and reflect on the crazy trip we are on. I have a couple of moments trying to evaluate where exactly we are, deep in the amazon jungle, riding around in a small river boat in the hot sun, next to my best friend and partner in crime. Days like these are what makes life great. One year ago I wouldn’t have imagined in my wildest dreams I’d be relaxing in the jungle. 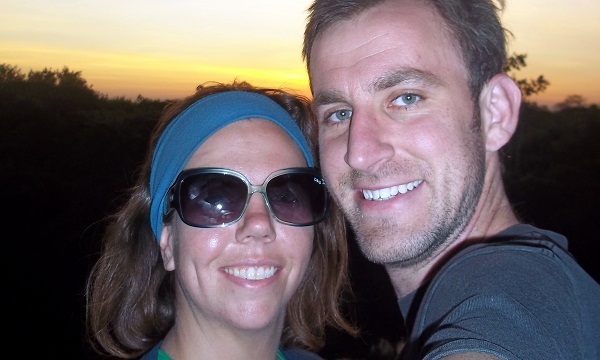 The next morning we woke up early to hunt anaconda. Yep. 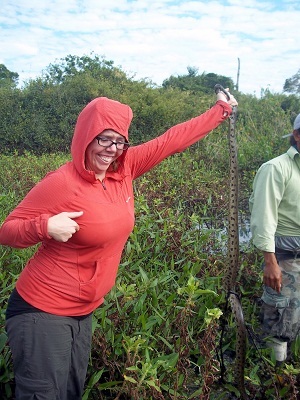 We put on our boots, hiked up our pants and walk around in a swamp with 1-2 feet of water looking for large snakes. Sounds like a good thing to do at 8 in the morning. The anaconda go into the swamp area to grow up. They grow up to 10 feet long in the swamp before moving to the river. Once in the river they can grow up to 15 feet long. The anaconda eat fish, birds, capybaras, and alligators. So that’s the little beastie we were walking around looking for. In addition to anacondas there are alligators everywhere and the venomous Aquatic Coral Snake. The tour guide spotted an anaconda and let us hold it. The one we found was about 6 feet long. Here is a picture of Leah holding it. 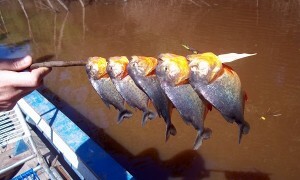 After we found the anaconda we went fishing for piranhas. They were feisty little guys, cleaning our hooks of bait many times. We caught enough for lunch, and the guides fried them up for us to enjoy. We watched one more sunset as we spent the last night in our jungle cabin. It was a great experience one we are going to remember for a long time. i miss bolivia a lot.